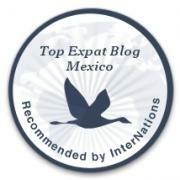 Wonderful Mezcal Tasting, Right Here in Mazatlán | ¡VidaMaz! Last week we attended a mezcal tasting at Water’s Edge Bistro, that very beautiful, tranquil and delicious restaurant in Centro Histórico at Sixto Osuna 48, on the corner of Niños Heroes. Heiman Russek Negrete, from Mezcal Minotauro, joined us from Durango. Mezcal Minotauro distills organic mezcales made with wild agaves/maguey plants. 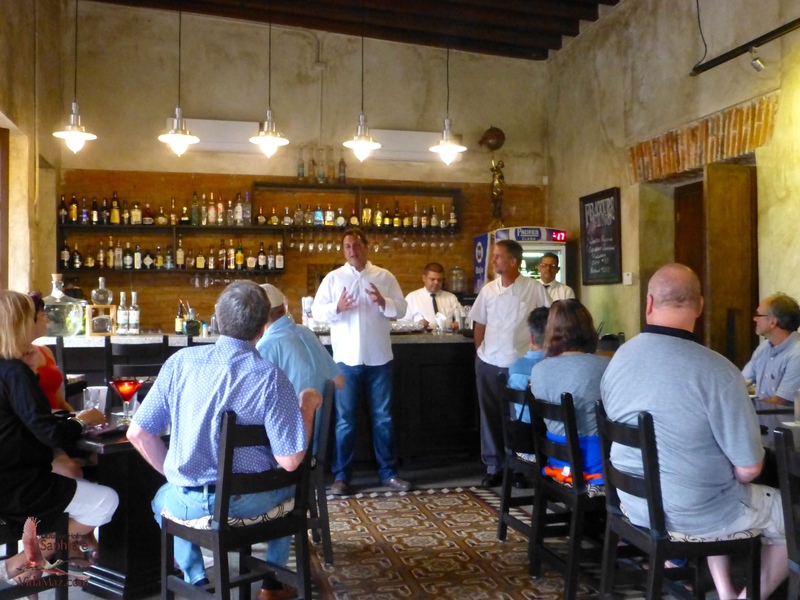 Heiman gave us a brief presentation on the history of mezcal, in very good English, shared with us information on the types of magueys, the states in Mexico that are authorized to use the appellation “mezcal,” and he also told us a bit about the production process. One cool bit of trivia I learned was that Minotauro has been able to play a role in saving a couple of species of maguey that were thought to be lost. He also showed us what he said is his favorite book on mezcal. I took a photo of its cover, so if you are interested, you can look into obtaining it. Heiman had four different mezcals to share with us. Chef Alastair and sous-chef Tony put together three small plates for us that were magnificent, and combined well with the mezcales. The first mezcal was white, young, and accompanied by a jicama taco of aguachile. The second mezcal was actually my favorite; the botana served with it was a mini-tostada with shredded meat—very savory. Unbelievably to me, I don’t have a photo of the second flight, but it was delicious. I guess I was enjoying it too much to fuss with the camera! The third mezcal was also very good. We drank it with shrimp and grilled vegetables on toast points. Heiman then served us a fourth mezcal as well. After that, I guarantee you I wasn’t taking any more photos! Click on any photo below to enlarge it or view it as a slideshow. The food was all outstanding, the event was very enjoyable, and what a value at 200 pesos! We love Water’s Edge. Alastair Porteous is a terrific chef who believes in farm-to-table sourcing, and his wife, Tracey Grantham, very ably runs the front of the house. It doesn’t hurt that another of our favorite local chefs, Tony Acuña Pérez, is the sous-chef. We also love the ambiance: the restaurant is in an historic home that was restored by Mark Jay. It is spacious, with two large rooms and a gorgeous private patio in the back. They have a stellar dinner menu, and lunch specials that are unbelievable values: drink, salad and main course for 100 pesos! Water’s Edge serves Sunday brunch, and Alastair conducts cooking classes. Tracey tells me that for Carnavál they are going to have some small foods outside, with easy-to-eat-and-go convenience for revelers. The restaurant will also, of course, be open. I urge you both to enjoy Water’s Edge, supporting high quality local cuisine, and to get on their list for special events. We really enjoyed the evening, and learned a lot as well. 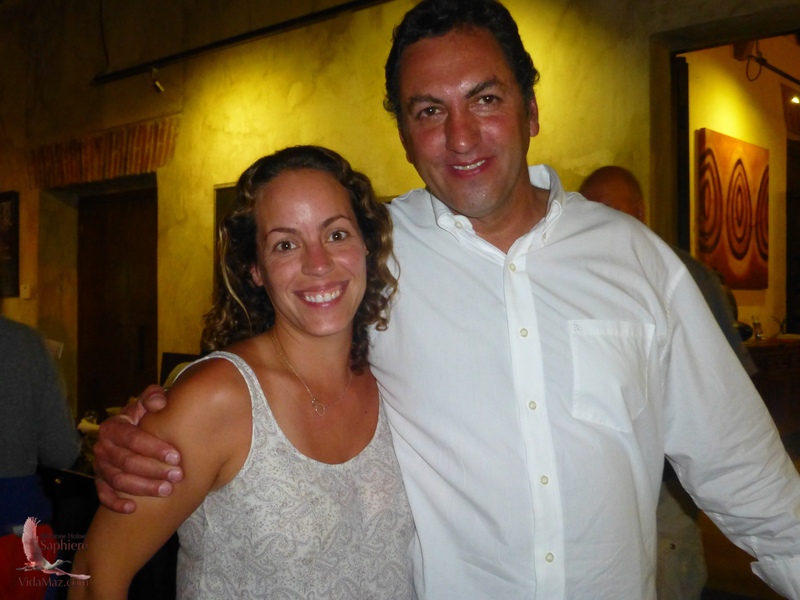 Plus, we are now looking forward to a mezcal tour of Durango, with a most amiable host and his wife!